We’re proud to be your Houston source for home demolitions. Here at JRP Tree & Demolition, we make demolition simple. After you give us a call, we’ll plan out your demolition, pull down your home, remove the debris, and we can excavate or level your lot once we’re done. That’s all-inclusive demo services, all provided by your local demolition experts. We’re ecstatic to see every demolition, including our residential demolitions, from start to finish. Proper demolition requires safety and precaution. Here at JRP Tree & Demolition, we strive to tackle our demolition projects from the right angle. We approach each demo with intention and planning in order to tear a home down safely. In addition, our crew is bonded and insured, so you can rest assured that you’re protected in the case of an accident. 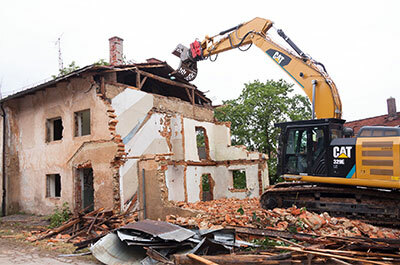 From sledgehammers to excavators, we have the tools it takes to demolish a home. Plus, since we use heavy equipment, a demolition can be performed in a matter of hours. We’ll knock out your residence with the right tools for the job. Let us know what timeline you desire, we’ll likely be able to work within your constraints! Our services don’t stop there. Pair demolition with excavation to prep your site for your next home build. Or, if you prefer, we can level your lot, leaving you with a blank slate. We also provide tree removal, alongside our demolition services, so that you can truly have a fresh start. Ready to get started? Don’t hesitate to get in touch with us if you have any questions, or if you’re ready to get a free quote on your upcoming home demolition project! JRP Tree & Demolition specializes in tree care, demolition, and excavation services. Our crew brings nearly three decades of experience to the table, and our company is family operated and owned (and we’re based right here in Houston). We value quality work, customer service, and timeliness. Take a look at our testimonials to learn about the JRP Tree & Demolition difference for yourself. Or, if you’re ready to get started, give us a call!